Keith Bettany Interview with ABC Adelaide 891, Evenings with Peter Goers. Reproduced with kind permission from the ABC. Keith’s interview starts at 3:10 in the below recording. Interesting talks by Des to his Rotary Club in 1995. Unfortunately the first talk was not recorded that covered the lead-up to war and the British Expeditionary Force’s exploits in Belgium and France, was not recorded. The seconds talk concerns his time back in England prior to his departure for the Far East. The third of Des’s talks concerns the voyage to Singapore, action in Malaya and Singapore, the capitulation and his subsequent experiences as a P.O.W. The Museum of Lancashire, Lancashire, UK. The Logan City Historical Museum, Kingston, QLD. Williamstown Library’s Heritage Anzac Display, Williamstown, Vic. In 1974, artist Des Bettany retired as Acting Principal of the oldest art school in Australia, the SA School of Art, now within the University of SA. 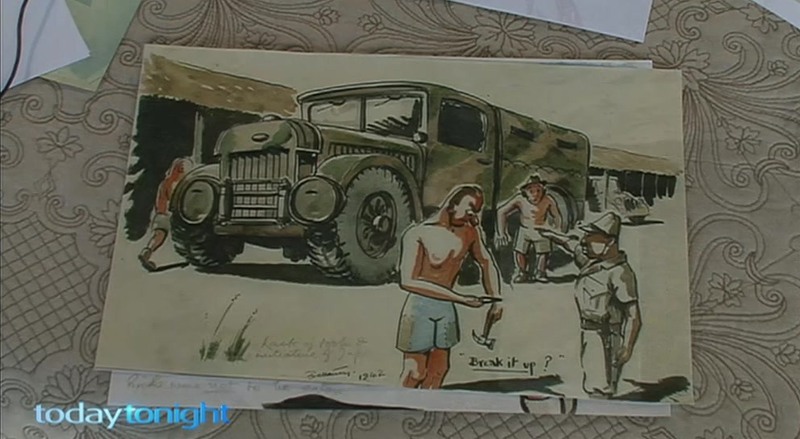 His journey to Australia began in the cruel setting of Changi – the Japanese POW camp, where he gained respect and affection for Australian prisoners, recording shared experiences in a fascinating cartoon legacy.